On April 20, 2016, Huntsman Family Investments, a private equity firm headed by Paul Huntsman, announced that they would be buying the Tribune. The newspaper's motto, at the top of its masthead, is "Utah's Independent Voice Since 1871." A successor to Utah Magazine (1868), as the Mormon Tribune by a group of businessmen led by former members of The Church of Jesus Christ of Latter-day Saints (LDS Church) William Godbe, Elias L.T. Harrison and Edward W. Tullidge, who disagreed with the church's economic and political positions. After a year, the publishers changed the name to the Salt Lake Daily Tribune and Utah Mining Gazette, but soon after that, they shortened it to The Salt Lake Tribune. In 1901 newly elected United States Senator Thomas Kearns, a Roman Catholic, and his business partner, David Keith, secretly bought the Tribune. Kearns made strides to eliminate the paper's anti-Mormon overtones, and succeeded in maintaining good relationships with the mostly-LDS state legislature which had elected him to the Senate. After Keith died in 1918 the Kearns family bought out Keith's share of the Salt Lake Tribune Publishing Company. Eventually, the parent company became Kearns-Tribune Corporation. In 1902 the company started up an evening edition, known as The Salt Lake Telegram. The Telegram was sold in 1914 and reacquired by the Tribune in 1930. It was phased out when the joint operating agreement was formed with the afternoon Deseret News, Salt Lake's daily newspaper owned by the LDS Church, in 1952. John F. Fitzpatrick became publisher in 1924, ushering in what became seven decades of peaceful coexistence with the dominant LDS Church. In 1952 theTribune entered into a joint operating agreement with the Deseret News and created the Newspaper Agency Corporation. Fitzpatrick was the architect of NAC at the request of Mormon Church President David O. McKay whose newspaper was near bankruptcy at the time. In 1960 Fitzpatrick died of a heart attack and was succeeded by John W. Gallivan who had been trained as the next publisher since he joined The Tribune in 1937. Gallivan often joked with aspiring journalism students telling them the best way to the publisher's desk was to get yourself left on the doorstep of the owner. (Gallivan was orphaned at age 5, then taken in by his mother's half-sister, Mrs.Thomas Kearns.) In the late 1950s, in spite of reluctance from John Fitzpatrick about the future of television, Gallivan joined a measured Tribune investment with The Standard Corporation in Ogden to build one of the first microwave and cable TV systems across northern Nevada. Gallivan traveled weekends by bus to Elko, NV to oversee the construction beginnings. Gallivan and Denver cable investor Bob Magness merged their companies into Tele-Communications, Inc. (TCI) which eventually became the largest cable television company in the world. The Tribune's ownership interest in TCI reached nearly 15% which played a large role in later mergers between the two companies. Gallivan remained in The Tribune publisher position until 1984 and chairman of the board until 1997. In 2002 the Tribune was mired in controversy after employees sold information related to the Elizabeth Smart kidnapping case to The National Enquirer. Tribune editor James "Jay" Shelledy resigned from his job at the paper amidst the fallout of the scandal. Two staffers also were removed from their positions as Tribune reporters. In 2004 the paper decided to move from its historic location at the downtown Tribune building, to The Gateway development. Many people, including several Tribune employees, opposed the move, stating that it would harm the economy of Salt Lake's downtown. The move was completed in May 2005 and Tribune employees were told by Editor Nancy Conway, "It is just a building." After emerging from bankruptcy in 2010, MediaNews Group lost control of its ownership to a hedge fund, Alden Global Capital. "The remainder of the Denver-based chain is owned by a consortium of lenders and by Singleton himself." In 2016, Huntsman Family Investments, LLC, a company controlled by Paul Huntsman, bought The Salt Lake Tribune. Paul Huntsman is the son of industrialist Jon Huntsman, Sr. who serves as chairman of the holding company, and brother of former Utah governor and ambassador to Russia Jon Huntsman, Jr.. In 2012, as it had in 2008, The Salt Lake Tribune endorsed Barack Obama for the presidency, despite opponent Mitt Romney's connections with both Mormonism and Salt Lake City, having had a hand in organizing their 2002 Olympic Games. In 2017, Tribune was awarded the Pulitzer Prize for Local Reporting for "a string of vivid reports revealing the perverse, punitive and cruel treatment given to sexual assault victims at Brigham Young University, one of Utah’s most powerful institutions." The team included lead reporter Erin Alberty, managing editor Sheila R. McCann, reporters Jessica Miller and Alex Stuckey and editor/writer Rachel Piper. The package of winning stories also included an investigation into multiple reports that were not properly investigated by Utah State University. In a December 2017 editorial, the Tribune called for Utah Senator Orrin Hatch to retire in 2018. In May 2018, the Tribune laid off over one third of its staff of 90, bringing the number to 56. The reason put forward for this is lower revenue due to decreased circulation and lower profit from online advertisements. This is despite the paywall placed on the Tribune website months before. ^ "US Postal Service Statement of Ownership, Management and Circulation (form 3526)". The Salt Lake Tribune. Salt Lake City. October 6, 2015. p. A6. ^ Semerad, Tony (April 20, 2016). "Huntsman family buying The Salt Lake Tribune, hopes to ensure 'independent voice for future generations'". Salt Lake Tribune. Retrieved April 20, 2016. ^ Leaders of the LDS Church had urged its members to eschew the Utah Magazine; its owners formed the Mormon Tribune in 1870 in retaliation. ^ "Brigham Young As A Ruler". 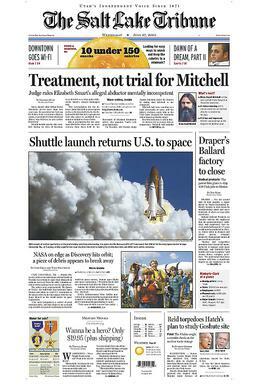 The Salt Lake Daily Tribune. August 30, 1877. p. 2. Retrieved 12 January 2018. ^ Malmquist,The First 100 Years, pp. 323–324. ^ Malmquist, The First 100 Years, p.? ^ Malmquist,The First 100 Years, pp. 373–376. ^ Barringer, Felicity (16 Dec 2000). "MediaNews Allowed to Buy Utah Paper from AT&T". The New York Times. Retrieved December 10, 2012. ^ Beebe, Paul (January 29, 2011). The Salt Lake Tribune. ^ Semerad, Tony (April 21, 2016). "Huntsman family buying The Salt Lake Tribune, hopes to ensure 'independent voice for future generations'". The Salt Lake Tribune. ^ Mooney, Brian C. (October 19, 2012). "Salt Lake Tribune endorses President Obama over Mitt Romney, who organized city's Olympics". The Boston Globe. Retrieved October 30, 2013. ^ "Tribune endorsement: Too Many Mitts". The Salt Lake Tribune. November 5, 2012. Retrieved October 30, 2013. ^ "Tribune Editorial: Why Orrin Hatch is Utahn of the Year". Salt Lake Tribune. December 25, 2017. Retrieved December 26, 2017. It would be good for Utah if Hatch, having finally caught the Great White Whale of tax reform, were to call it a career. If he doesn’t, the voters should end it for him. ^ "The Salt Lake Tribune Lays Off One-Third of Newsroom Staff". The New York Times. 2018-05-14. ISSN 0362-4331. Retrieved 2018-05-17. Wikimedia Commons has media related to The Salt Lake Tribune.